It seems like just a few weeks ago we were talking about late July practices in 90 degree heat as teams started getting ready for the high school football season. Now, the Coastal Carolina Fair is starting. It is hard to believe, but the end is almost upon us. 4A teams have just two regular season games left; while all other schools are down to their last game of the regular season. Cross is already finished with its regular season. Last week seemed to be a boring week with not a lot of interesting games, but anything can happen any week in HS football. Bishop England was an underdog to Woodland at home, but blew them out 35-7 on Daniel Island to take control of their region and probably earn another region title. Wando gave Goose Creek one of its biggest scares in the season. QB Dantez Bennamon was knocked out in the first half, and Goose Creek went to its backup. The Gators though had a quick stretch late in the second quarter with two TDs in less than a minute, then coasted through the second half to win 49-21. Summerville is peaking at the right time. They blew out Colleton County 56-21, a game that was expected to be a little closer. Stratford looked to be sleepwalking thru the first half of their game at West Ashley, only leading 7-0 at half, but the defense strengthened in the second half as they shut out the Wildcats 21-0. Fort Dorchester blew out Bluffton, while Ashley Ridge stole a game from Beaufort with a late TD. Cane Bay continued its losing ways, going down 27-3 to West Florence. They have two chances (@ Wando and West Ashley) to avoid a win-less season. In 3A, Hanahan clinched their region title, blowing out Hilton Head 55-21. Orangeburg-Wilkinson went into Moncks Corner and beat Berkeley; while James Island got their second win of the year beating Stall. James Island hosts Orangeburg-Wilkinson this week, while Berkeley travels to Hilton Head. In 2A, North Charleston beat Academic Magnet; Garrett lost again, this time to Ridgeland/Hardeeville, and Burke lost again, to Battery Creek. Two weeks ago, Burke scored 26 against Academic Magnet. In their other 8 games, they have scored only 20 points. 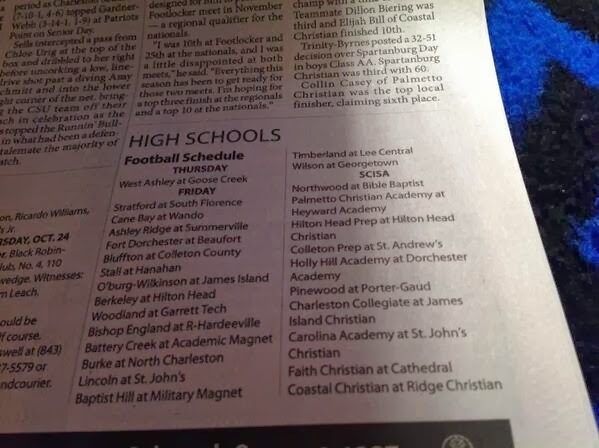 They have to beat North Charleston this week to avoid a win-less year. In 1A, St. John's suffered a heartbreaking loss to Whale Branch; Cross beat Baptist Hill, and Military Magnet blew out Lincoln. In SCISA play, James Island Christian lost their first of the year to Beaufort Academy, Palmetto Christian and Northwood Academy lost; while Pinewood Prep lost again. They have to beat Porter-Gaud to avoid a win-less season. Charleston Collegiate travels to JI this week. Weather could be a factor Friday night. The NWS forecast shows a chance of rain for most of the area. Already a couple of games in the Pee Dee have been moved to Thursday. Except for a couple garden-variety showers over Mt. Pleasant which cancelled a Palmetto Christian game and a few other showers, weather has not been a factor in the Charleston area this year. It could be one Friday. Quick hits: Lincoln (1-8, 0-3) at St. John's (5-4, 3-0): St. John's controls its own destiny headed into this game with Lincoln. They can clinch at least a couple home playoff games with a win here. Battery Creek (4-5, 3-3) at Academic Magnet (3-6, 1-5): This game is mainly for playoff positioning, but Battery Creek can clinch at least its second straight five-win season after just four wins the previous three seasons. Bishop England (7-2, 6-0) at Ridgeland-Hardeeville (6-3, 5-1): Bishop England can officially clinch a outright region title with a win, but this comes with the long trip to Jasper County. Ridgeland-Hardeeville is playing for a possible tie for the region title with a win. Bluffton (5-4, 1-2) at Colleton County (2-7, 0-3): Bluffton was bludgeoned last week by Fort Dorchester; now they face a hungry Colleton County team on their senior night. There's a chance for an upset here. Cane Bay (0-9, 0-2) at Wando (3-6, 1-2): Wando hosts their final region game against winless Cane Bay before going to Sumter next week. Winning here probably means a playoff berth. Baptist Hill (5-4, 1-2) at Military Magnet (4-5, 1-2): Another big game for playoff placement. Baptist Hill can clinch a winning season with a win, while Military Magnet can get its best record since 2009. Top games: 5. West Ashley (5-4, 0-2) at Goose Creek (9-0, 2-0) (Thursday): West Ashley has been an improving team throughout the season, but last week lost to a suffocating Stratford team 21-0. Goose Creek went through a lot of adversity against Wando, but eventually won by four touchdowns, overwhelming the Warriors like what they have done to most opponents. This could be an interesting game. Halloween night, on a short week, with a hungry West Ashley team looking for an upset. The Gators better not be looking forward to next week's battle at Stratford. West Ashley has some talent. Will the ghosts and goblins be out? 4. Berkeley (4-5, 2-2) at Hilton Head (7-2, 2-2): Hilton Head has run into a tough stretch of games recently. They started 7-0, but had to go in consecutive weeks to Orangeburg-Wilkinson and Hanahan. That's a combined 224 miles on the bus in two weeks. They were blown out in both games. Now, the Seahawks are back with their home fans for the final game of the regular season. Berkeley needs this game to avoid another losing season. Jeff Cruce is on the hot seat no matter what happens; they will have to travel on the road for the playoffs if they make it. Hilton Head, even with seven wins, most likely will travel for the playoffs as well. This is still a very important game in-region to close the regular season. 3. Fort Dorchester (6-3, 2-1) at Beaufort (6-3, 1-2): Beaufort was in a very good position two weeks ago; 6-1 with a chance to take control of the region with a win over Summerville. Instead, they have laid two Dorchester County eggs. They were shut out by the Green Wave, and inexplicably lost to Ashley Ridge last Thursday night as their K missed a FG and an XP. Now, Fort Dorchester is surging; they could get the second-place spot in Region 8-4A, which would probably mean hosting their first playoff game. Beaufort is on the downturn; they could face having to go on the road for the playoffs, or if they somehow lose their final two, maybe miss the playoffs altogether. The Eagles want to right the ship Friday night. 2. Ashley Ridge (4-5, 2-1) at Summerville (7-2, 3-0): On the other hand, both Ashley Ridge and Summerville are surging teams. The Swamp Foxes started the year 0-4, but they've won four of their last five to set up a very important game Friday night. Summerville has only lost to Goose Creek and Stratford, and showed their might last week against a pesky Colleton County team. Summerville has suffered several injuries to some of their key players, but like many old John McKissick teams, they have depth. Summerville is playing some 9th and 10th graders at RB after Davon Anderson left prior to the season (his Glenville team didn't allow a single point in October). Summerville's young team is gelling this year, and could be a force in the next couple seasons. They still have business to take care of in their final two regular season games. 1. Stratford (9-0) at South Florence (9-0): It is rare that two teams this late in the season play a non-conference game, let alone one with two teams still undefeated. Several people on message boards I read were underestimating this game because both schools have important region battles next week; Stratford against Goose Creek, and South Florence against West Florence. Still, this is a battle between the #5 and #6 teams in the state in 4A. Stratford coach Ray Stackley has done this for years, playing opponents from other parts of the state, but other coaches should try and play opponents from other areas. But Stratford and South Florence are doing that Friday night. This might be the biggest game in the Pee Dee so far this year. South Florence averages nearly fifty points a game. Other than a 28-21 win against Sumter, the Bruins have won every game this year by at least 27 points. Stratford is led by QB Jacob Park, the Georgia commit who has thrown 19 TDs this year; while South Florence is led by QB Nick Jones, a junior who has thrown for 28 touchdowns against just 5 interceptions, and has also run for 10 touchdowns. This game will be a battle of the QBs. Whoever has the better game will win for their team, and will advance to their cross-town battle next week with an undefeated record.